There is no doubt that being the first pick in the NBA Draft is something to be proud of, but it can raise expectations. Some players thrive on the raised expectations; other players struggle to live up to the fact that the eyes of the world are watching them. 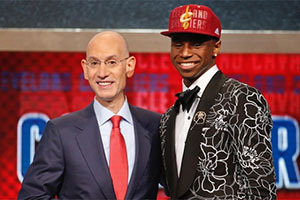 Given the fact that NBA Draft first picks are generally youngsters, it can seem as though your entire life has changed and it should be understandable that things are seemingly getting out of hand far too quickly. The past two first draft picks in the NBA haven’t been too successful, but there may be a new lease of life coming for these players. 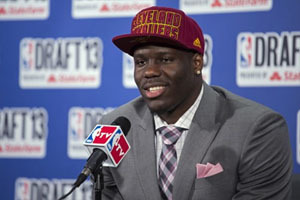 It seems as though Anthony Bennett and Andrew Wiggins, the two most recent first picks in the NBA Draft, are likely to be traded from the Cleveland Cavaliers. They are tipped to be heading in the direction of Minnesota to join the Timberwolves, as Kevin Love, the All-Star forward, is scheduled to make the journey in the opposite direction. The move won’t happen right away, there is a need to wait until at least the weekend as Wiggins is not eligible for a trade until this point but once this occurs, it is all systems go for carrying out a trade that could have an impact on the league and the lives of the players involved. While Anthony Bennett struggled in his opening season, he has managed to shift some weight of late, and many observers felt that he was impressive during the summer league. The player has himself stated that he has learned a lot in the past year and that he is fully focused on making a much improved impact in the new season. If you think that this trade will have an impact on the NBA season, you’ll be delighted to know that basketball betting is in full swing for the new NBA season. We may still be a few months away from the new NBA season but you can already enjoy the futures market for the 2014/15 NBA season. The fixture list is out and even though the FIBA World Cup is in the way, there are a lot of people getting highly excited about what the new NBA season entails. As you would expect, when asked, neither Bennett or Wiggins opened up about the trade, preferring to state that they are just focused on the basketball although the fact that Bennett stated, “Wherever I end up, it doesn’t really matter to me, I Just want to play basketball” is perhaps indicative of a man that knows he has a career change in the offing. Bennett is also the ideal candidate to offer advice to Wiggins on how tough life can be when you are a first pick in the NBA Draft but publically, the advice has just been to work hard and not worry too much about what other people say. With the first tip-off of the new NBA season still a long while away, teams will be fine-tuning themselves for a good while to come. This trade is likely to be just one of the twists and turns that take place over the course of the summer, which means that there is plenty for NBA fans to look out for when it comes to planning how the new season will pan out.